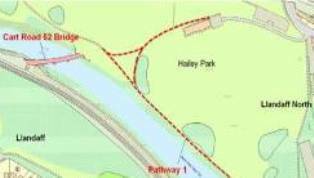 The bridge over the River Taff at Hailey Park in Llandaff North (Cart Road 52) is being re-opened to public use. To support this project, two pathways in Hailey Park (Llandaff North) are proposed to be improved in the current financial year (2012/2013). The pathways can be seen at above. A cost estimate for the works will be sought from the Parks department. It is anticipated that the scheme will be funded by the NRS and the Cycling budget. One further pathway in the ward of Llandaff (linking the bridge to the Radyr sidings development) will be improved in the next financial year (2013/2014). Pathway 2 is a narrow stone pathway connecting the changing rooms to the bridge. It is currently too narrow to allow cyclists and pedestrians to pass each other and requires widening. It is proposed that the materials used for this pathway will be suitable for cycling and pedestrians. The introduction of appropriate signage, street furniture and additional elements subject to final cost estimates will also be considered. Hailey Park is owned by the Parks department and estimates for the work will be sought from the Parks department who will also be instructed to project manage the scheme. Consultation will take place with Local Members; Friends of Hailey Park; Local Access Forum; Council departments (Parks, Highways, Cycling, Access + Drainage Officer) and Police and Community Support Officers. Cart Road 52 ‘Pathways Project’ NRS Scheme September 2012. Site notices and a plan will be prepared explaining the pathway improvements. These will be displayed on site in accordance with the timescale below. The site notice will reference where more detailed plans can be viewed, for example at Llandaff North libraries and online at the Council website. Contact details of Neighbourhood Regeneration will be identified on the site notice.